Dorymyrmex insanus is one of a confusing tangle of western Dorymyrmex forms that are in need of taxonomic revision. The species of southwestern North America have been shifted between different genera and species names numerous times over the past 100 + years. Snelling (1995) nicely summed up the plethora of problems with insanus: "No North American ant has been cursed with such a singularly unfortunate taxonomic history as that described by Buckley (1866) as Formica insana." 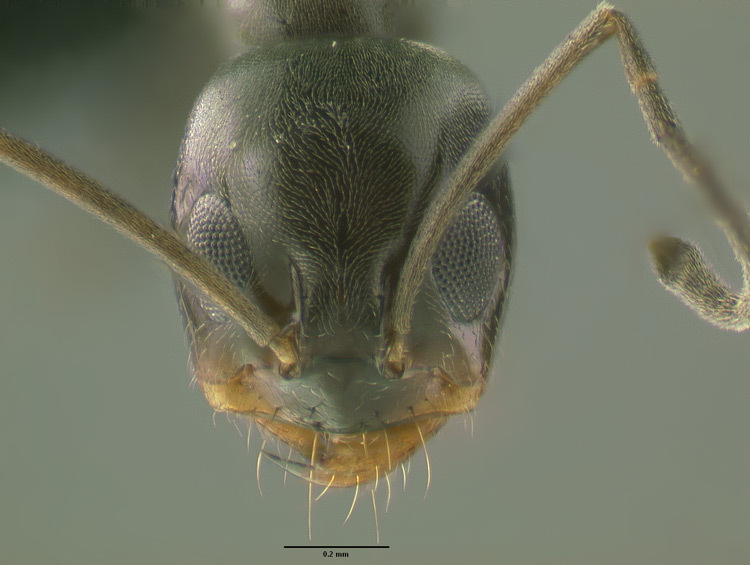 Fisher and Cover (2007) state "In all Dorymyrmex, the propodeum has a single, more or less vertical tooth, or "cone," at the junction of the dorsal and posterior faces." 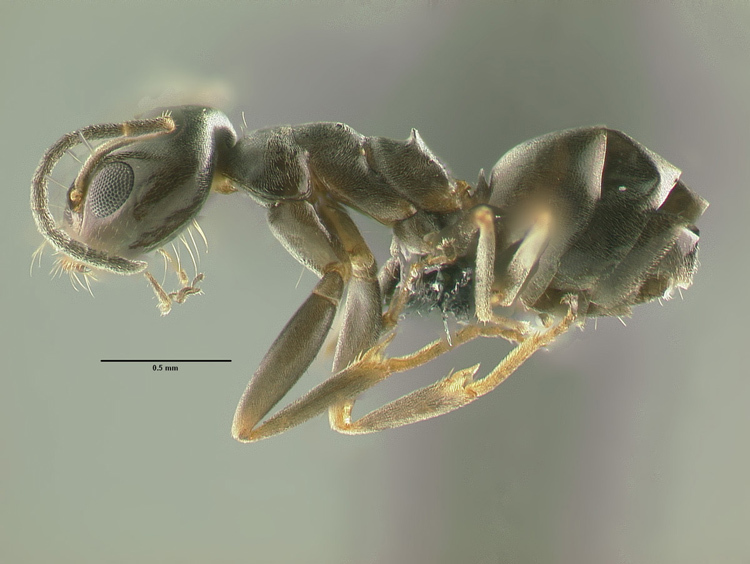 If you find a worker ant within the confines of the Colorado Plateau with this morphology you have collected a Dorymyrmex species. 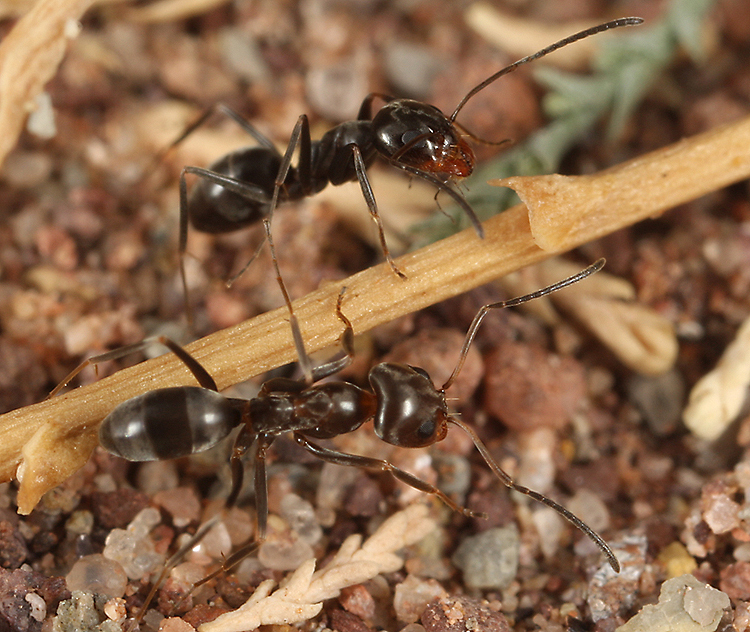 If the workers possess a black gaster and light colored (various shades of yellow- red) head and mesosoma, you have collected Dorymyrmex bicolor. If the workers are concolorous brown or gray your best solution, pending a revision of the group, may be to provisionally assign it the name insanus. 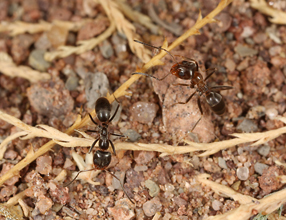 These ants, like all North American Dorymyrmex, thrive in hot, open xeric habitats. Workers are opportunistic predators that can quickly recruit many individuals to newly discovered food. Their diet is quite varied. Foragers will readily imbibe honeydew, or any nutritious liquids they encounter, but will also feed on vertebrate carcasses. SW United States and N Mexico. Difficulty in delimiting the various forms in this group leads to some ambiguity concerning its distribution. 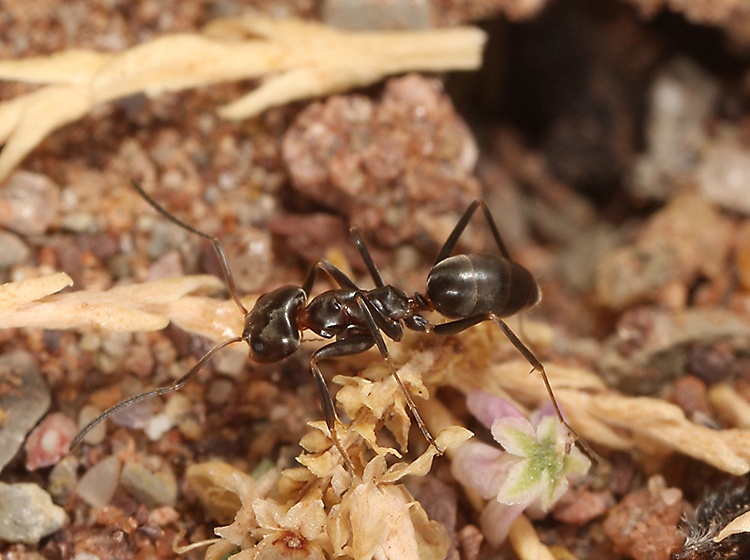 A number of factors help make these ants a conspicuous part of the southwestern U.S. ant fauna. Nests occur in open ground or in sites with a low profile vegetative ground cover. Their ability to thrive in hot, open dry areas allows them to also do well in disturbed sites. This in turn puts them into direct contact with anyone that spends time outside, be it out in the desert or in heavily settled areas, in the southwest. 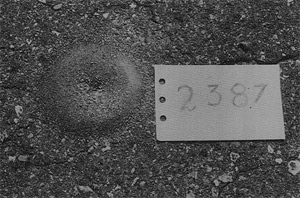 Their ground nest entrances are small holes in the ground that would be relatively inconspicuous except for the small crater mounds (up to ~ 10 cm in diameter) of soil that surround them (photo from Wheeler and Wheeler, 1986). These mounds are made all the more obvious by their tendency to occur in clusters. Workers tend to be quite active and tolerate heat better than most species that they co-occur with - although they will stop foraging during the most intense heat of the day during the warmer times of the year. Foragers can form long foraging trails that contain many individuals. These streams of undulating ants flow over, under or around objects that are in the path of such a trail. While individuals workers are small, their dark coloration often contrasts with the lighter soils where they make their nests. Quick movements, foraging trails full of workers, their nesting biology, and an ability to be out in force during hot, sunny days when most ants remain in their nests all make Dorymyrmex insanus quite noticeable. Descriptive. Buckley's original description included a parenthetic addition "Crazy Ant" following the listing of the proper name. 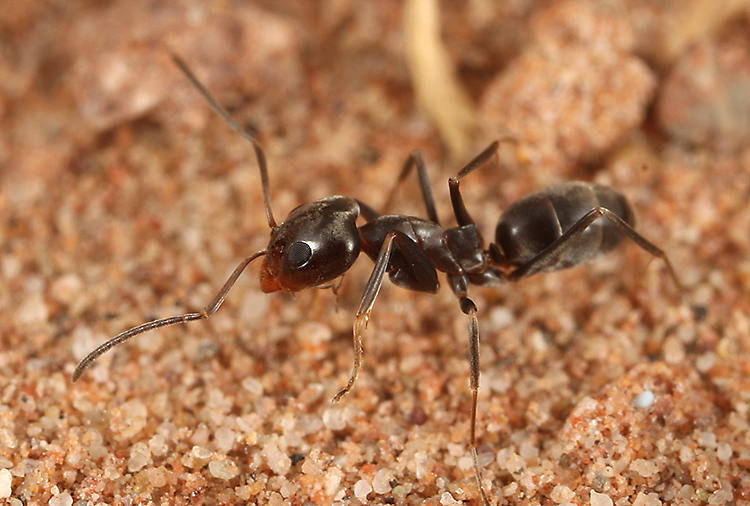 Both insanus (= insane) and crazy ant are fitting for characterizing these Dorymyrmex's frenetic movements and their ability to swarm upon and engulf prey, enemies and other food items. Fisher, B. L. and S. P. Cover. 2007. 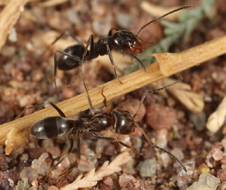 Ants of North America: a guide to the genera. University of California Press, Berkeley.